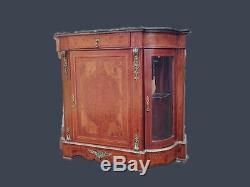 ANTIQUE FRENCH COMMODE/BUFFET/SIDEBOARD LOUIS XVI -1900. In this ad I present a French beautiful buffet/commode/sideboard made of fruit wood. It is decorated with very nice figures of inlaid wood and bronze decorations. It has one drawer that is decorated with bronze. It has three doors, one big door at the front and two glass doors at the sides. Behind those glass side doors there are small glass shelfs which makes them etageres. The sides of this buffet are in courbé form (French for half round). The buffet has a marble top in a beautiful colour. This buffet has been made around 1900. The buffet is recently overall cleaned and restored recently. The size of the buffet are about: 105 x 120 x 50 cm (H X W X D). This is in inch about: 41 x 47 x 20 inch. Send us your full address including zipcode and we'll get back to you as soon as possible. Local costs are not included. We offer the items as we send them. With antique used items there is always a chance that the item has marks of usage. We are an antique dealer specialized in antique French, English and Italian furniture. We sell furniture, lightning, clocks, tables, chairs and paintingsa as well as reproduction furniture. We can also make special models by order. We always are looking for merchandisers who make big orders with us. They will get a special price. We also sell reproduction furniture. The item "ANTIQUE FRENCH COMMODE/BUFFET/SIDEBOARD LOUIS XVI -1900" is in sale since Friday, November 21, 2014. This item is in the category "Antiques\Furniture\Sideboards & Buffets\1900-1950". The seller is "hollandantique" and is located in Loenersloot. This item can be shipped to United States.